A rare and very distinctive flowering crab apple variety, Guardsman (Malus trilobata 'Guardsman') hails from the Mediterranean and north-East Greece. It is a form of the unusual M. trilobata species. This tree has a stiffly erect form with pretty, deeply lobed maple-like leaves which turn good shades of scarlet-crimson in autumn. 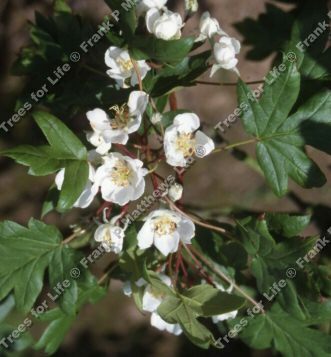 The white flowers are large and appear late in June. Small moss green fruits. This tree is supplied at a height of between 1.5 and 2.0 metres in a 5-12 litre container for year round planting and better results than from either bare-root or rootballed stock.